Science is important to governments, the economy and business. Leading sustainability focused corporate efforts are engaging science-based efforts including emissions reduction targets. Science is enhancing business and driving them to adopt fact-based objectives. There is a mutually beneficial relationship that is emerging between business and science. As explained by Ros Le Feuvre, SYNBIOCHEM director of operations at the Manchester Institute of Biotechnology, "I think the academic community is becoming more aware of the commercial potential of their science and how to exploit it, there is a more open culture and increased dialogue. Over the past decade we‘ve developed closer relationships with industrial partners, from large multi-nationals to smaller start-ups." However, the long-standing relationship with science is being eschewed by the Trump administration. Even though scientists have urged Trump to acknowledge the science and act on climate change he has put forth a raft of Executive Orders designed to end climate action and kill regulations that protect the environment. Trump's budget cuts science funding particularly as it relates to climate change. Trump wants to slash funding to climate science agencies by 17 percent. The focus is on eradicating government funded climate research. In fact the Trump administration has eliminated any mention of climate change from the White House site. The Trump administration's disdain for science has serious consequences. We need a science based assessment of the value that sustainability brings to our economy and our planet. We need to look at an objective review of the costs of action versus inaction. Such a cost-benefit analysis squarely refutes the efforts of the Trump administration. When governments ignore science, math and statistical models they will not be able to govern effectively. The same can be said of businesses. The business community cannot afford to avoid scientific appraisals of their impacts. Nor can they minimize their impacts and grow their revenues in the absence of such objective appraisals. Businesses need science, it helps them to identify and mitigate against risk. Science helps businesses to develop products and services, it is an integral part of the technologies they employ and it is a fundamental component of being a responsible enterprise. There are a number of good reasons why businesses are embracing sustainability. Contrary to the irrational politically motivated assertions of the Trump administration, science helps us to see that sustainability is a boon and not a liability. "In industry we need to hear from science now more than ever," says John O’Brien, deputy head of the Nestlé Research Centre in Lausanne, Switzerland, "but we’re living in an era where there’s lots of skepticism of science that we need to take into account...scientists and businesses have a responsibility to work together to understand and inform the public." Science helps some of the world's largest corporation to show leadership on water stewardship. It also helps them to make smart choices about clean energy and waste management. In the absence of science these efforts would be arbitrary and ineffectual. Businesses cannot afford to follow this administration misguided, confusing and contradictory approach to governance. Forward-looking businesses are resisting the Trump administration's anti-science agenda because it undermines their business model. 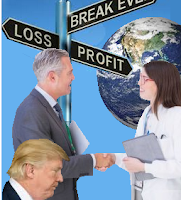 This administration's antipathy towards science serves their political agenda, but businesses that follow their lead do so at their own peril.